J.M. Whipps, Developments in the Biological Control of Soil-Borne Plant Pathogens. P.R. Shewry and J.A. Lucas, Plant Proteins that Confer Resistance to Pests and Pathogens. D.J. Beerling, The Net Primary Productivity and Water Use of Forests in the Geological Past. L. Colombo, A.J. van Tunen, H.J.M. Dons, and G.C. Angenent, Molecular Control of Flower Development in Petunia Hybrida. R.C. Leegood, The Regulation of C4 Photosynthesis. J.D.B.Weyers and T. Lawson, Heterogeneity in Stomatal Characteristics. Subject Index. Advances in Botanical Research is a multi-volume publication that brings together reviews by recognized experts on subjects of importance to those involved in botanical research. For more than thirty years, Advances in Botanical Research has earned a reputation for excellence in the field. For those working on plant pathology, Advances in Plant Pathology has also carved a niche in the plant sciences during its decade of publication. 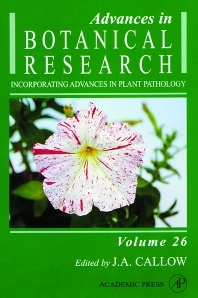 Academic Press has merged Advances in Plant Pathology into Advances in Botanical Research. The plant science community will find that the merger of these two serials will provide one comprehensive resource for the field. To ensure complete coverage, John Andrews and Inez Tommerup, the editors of Advances in Plant Pathology, have joined the editorial board of the new series, which will include equal coverage of plant pathology and botany in both thematic and mixed volumes. The first fewvolumes of the new series will be slanted toward botany or plant pathology; however, future eclectic volumes will be fully integrated. The resulting synergy of these two serials greatly benefits the plant science community by providing a more comprehensive resource under one roof. The joint aim is to continue to include the very best articles, thereby maintaining the status of a high impact factor review series. Plant scientists, postgraduates, and researchers, especially those in botany and plant pathology.